Justice F. Walter Bliss was born in Gilboa, Schoharie County, on April 27, 1892. His father was a merchant and county clerk. He graduated from Poughkeepsie High School in 1908 and from Cornell University in 1913. In 1915, he graduated from Albany Law School. He began practicing in Middleburgh, Schoharie County, in 1916. Shortly thereafter, he enlisted in the Army for service during World War I. He served as a first lieutenant in the Army Signal Corps. After the war, he returned to his Middleburgh practice. In 1922, he began six years of service as Schoharie County Attorney. He gained prominence when he successfully represented the Town of Gilboa in a landmark suit against New York City resulting in an order requiring the city to pay taxes on Gilboa dam and reservoir, which supplies water for New York City. On October 1, 1930, Gov. Roosevelt appointed him to the Supreme Court to fill a vacancy; he was elected to one 14-year term in November of the same year. In l931, he presided at the second trial of the notorious Jack "Legs" Diamond. On January 1, 1933, by appointment from Gov. 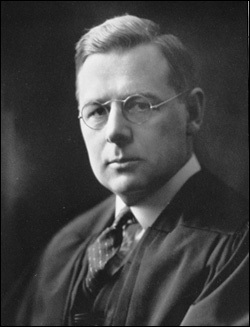 Lehman, Justice Bliss began service on the Appellate Division, Third Department; he served on the court until the end of 1944. While on the Appellate Division, he would return to Schoharie County annually to serve a two-week term as a Supreme Court trial justice. After his judicial service, he resumed the private practice of law, mostly in Schoharie County; he continued practicing almost until the date of his death. At the State Democratic Party's l950 nominating convention in Rochester, Justice Bliss was the unsuccessful candidate of upstate delegates for the party's gubernatorial nomination. In l965, by reference from the Court of Claims, Justice Bliss was one of a panel of three referees to hear and decide an action against the State by the Thruway Authority. The case resulted in an award of over $31 million to the Authority. In 1939, Central College of Pella, Iowa, awarded him an honorary degree of Doctor of Laws. He served as a trustee of Howe Caverns from l947 to l965; then as president from l965 to l982; and finally as chairman of the board. He died on September 8, 1982, at the age of 90.